The January 2015 newsletter from PC410.com is ready. This month, there’s a dollars and cents explanation of image backups; having a proper image backup will save you a lot of cash, when it’s time for a hard drive replacement or a ransomware cleanup. Subscribe here. The PC410 business technology newsletter is a monthly publication, mostly. There’s are articles on the 10th of each month, and emergency computer security news when needed. Shortcuts? We don’t need no bleenkin’ shortcuts… No, wait. Windows 8 is based on touch, or at least it is until you run a program. But nearly everything that can be touch-done can be keyboard-shortcutted. 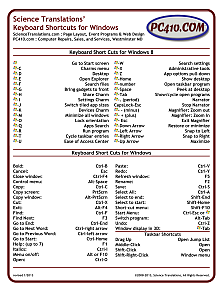 The new printable shortcut chart for Windows 8 keyboard shortcuts is available for free download now over at PC410.com. Jerry Stern is webmaster at PC410.com and Startupware.com. ISVCon is Coming Soon. Here’s a Deal. The NEW Software Industry Conference, newly re-branded as ISVCon by the ASP, will be in Reno, Nevada July 13 to 15. This is the best conference to attend to learn how to market software, to meet service providers, and to find out what other ISVs, or Independent Software Vendors, are doing to expand their businesses.